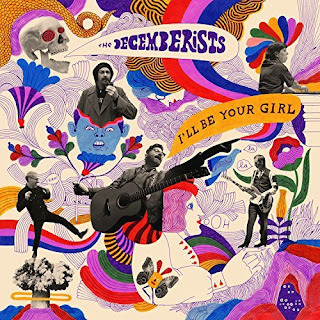 The Decemberists have a new disk out - I'll Be Your Girl. I was hesitant when I heard the first track, "Severed", which was a My Music Monday track about two months back. Ruckiry (not Jon's boss) , I first thought, the rest of the disk isn't so electronically based, though it does stretch the band's norm. That initial song has grown on me quite a bit, but it's not tip-top or anything. Except on I'll Be Your Girl, it is tip-top - at least on this disk. It might be the best thing they have to offer this go-round. The rest of the album is mostly a dud. I give them points for trying new things, but when it comes down to it, much of it isn't too much out of their territory, and it's just dull. The opening "Once in My Life" isn't bad at all, but it harkens back to most of everything they ever did, still it could have been a good transition to something very new and different. It does have some heavier synths on it. The next song is "Cutting Stone". My big question to this is: "why"? More synths - but that's fine. It' the inane lyrics that sink this song. I kind of like "Starwatcher" (though Colin Meloy sings "Skywatcher, so.......there's that). And I like "Tripping Along". But this is where the 'like' ends. Then it is one mediocre or bad song after the next. I had high hopes when "Rusalka, Rusalka / Wild Rushes" began. About halfway through, the promising song turned to boom boom. Maybe it's when they moved to the "Wild Rushes" movement of it, I don't know. There were times I wanted to hit the fast forward button, but I forced myself to not do that. I listened with an open mind. But most of the song just didn't gel. I love that the band takes risks in sound, but when it comes down to it, the songwriting was disappointing.